Last year’s performance of Kubu. The V18 special edition of the Malta International Arts Festival opens today, celebrating art in its forms – from music, visual arts, theatre, dance, opera, installations, films to community projects and interactive and participatory events – in venues and spaces of historical significance and in site-specific curated projects. 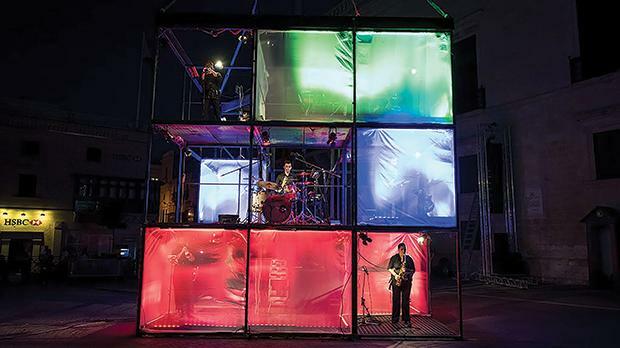 The festival will kick off with Kubu+, which will see musicians performing in a detachable structure in St George’s Square, Valletta, today at 9.30pm. An ensemble from the Big Band Brothers, made up of seven percussionists, four brass players and two pianists, will perform an original score composed by Daniel Cauchi and Alex Bezzina. This project is designed by danDlab and is under the artistic direction of Daniel Cauchi. The Big Band will be preceded by a performance titled Imagery in Motion by Israeli-born dancer Oded Ronen at 9pm. The choreography and performance practice, based on specific imagery, is used for a deeper understanding of the movement possibilities of the body. The images are crafted to bridge between the worlds of imagination and physics. Entrance to Kubu+ is free. Also as part of the festival, an interactive sound installation called Bandli has been set outside Esplora in Kalkara. Each swing in this installation is equipped with a motion sensor so that music is triggered through the swinging action. Different instruments are assigned to the eight swings so that the whole structure functions like a music ensemble that is brought to life through the interactive engagement of the public. The music is composed by Albert Garcia, Alex Vella Gregory and Mario Sammut, with creative coding and music interfacing by Andrew Schembri. The Malta International Arts Festival runs until July 15. For more information, visit www.maltaartsfestival.org.